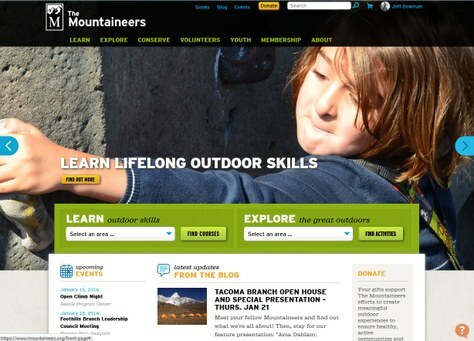 Our minions were busy late last year into the early days of 2016 to give us mountaineers.org 2.5, including improvements for seminars & clinics and site-wide search, and new features for our youth programs. Seminars and clinics can now be found in both Explore: Find Activities and Learn: Find Courses, Clinics & Seminars searches, because they often have nearly equal elements of something that is "education" and a "trip." Leaders can now schedule clinics and seminars (aka single-activity courses) in one smooth process. Once the necessary seminar & clinic template is added, it's as easy as scheduling an activity. To get started, choose a route/place. Visit our Schedule a Course, Clinic, or Seminar page to learn more about setting up the templates you'll need and scheduling and managing courses, clinics, and seminars. And if you need more help, contact our Member Services Team at info@mountaineers.org or 206-521-6001. We integrated the site-wide search box into the header on every page so you can more easily and quickly search for any type of content no matter where it is on our website. We improved the theme and usability of the site-wide and page-specific portlet search results. These now appear like our Find Activities and Find Courses searches—filters are in the left column and nicely-formatted search results appear in main area of the page. Our Leader Resources, How Tos and Mountaineers Annuals are pages where we use page-specific portlet searches that we introduced in the mountaineers.org 2.4 release. We reconfigured the search scheme for a much improved balance of speed and complete sets of search results. This is a most noticeable improvement when searching for information in type-ahead search boxes on edit forms. An example is searching for a person to add to a roster or adding a badge as pre-requisite to a course. Our youth programs are an important and growing part of our organization, drawing people to us and our mission. We've added some much-needed features to support these vital programs. We made it easier to choose family members when registering for a youth program. We also included a link to add a family member if needed. We added a "chaperone roster," so our youth programs now have "participants," "instructors" and "chaperones." If chaperones and/or instructors are needed, you'll see all three options in the youth program's registration portlet. Instructors can now register directly on the youth program's page, in addition to using the Find Instructor Opportunities search. Youth registering for summer camps may choose one friend with whom they wish to be paired for summer camp activities. We improved the theme for youth programs, so you'll now see "youth program" language on youth program pages instead of the former "course" language. We added age parameters for use in our youth programs and their activities to help ensure that youth may only be enrolled in programs for their age group. If you need more help or have questions about our youth programs, contact our Member Services Team at info@mountaineers.org or 206-521-6001. We renamed "My Courses" to "My Courses & Programs" to indicate that any courses and youth programs in which you are enrolled or registered as an instructor or chaperone are listed here. We added toggle options to your My Courses & Programs page so that you can view and hide the activities that go with each of your courses, whether you're taking or teaching the course. We improved your My Courses & Programs page for courses that have rolling enrollment. Now only activities between the start and end dates of the course will be displayed. We added "show canceled", "show waitlisted", and date range filters to both your My Courses & Programs and My Activities pages so you can more quickly find what you want. We improved instructions for closing an activity. The steps in the process are now a numbered list, so it should be easier to know what to do and in what order. We added the ability to update mileage and elevation gain when closing an activity. Visit our Schedule an Activity page to learn more about scheduling and managing an activity. Tell us about it! As our programs and needs evolve, so does our technology. We always try to balance the many requests we receive for website enhancements with the needs of the entire organization. If you have suggestions, please look at the forums in our "Feedback" pages where you can vote on each others ideas.